Few leaders can claim to have overcome obstacles as large as those faced by retired four-star General Stanley A. McChrystal. McChrystal has been praised for creating a revolution in warfare that fused intelligence and operations, retired four-star General Stanley McChrystal is the former commander of U.S. and international forces in Afghanistan and Director of the Joint Special Operations Command (JSOC) that captured Saddam Hussein and killed Abu Musab al-Zarqawi, the leader of al-Qaeda in Iraq. With McChrystal at the podium, NECA’s 2011 Opening General Session, Sunday, Oct. 23, 10:15 a.m., promises to be an insightful and frank discussion on what it makes to be an honorable leader in difficult times. Earlier, during the Persian Gulf War, he served in a Joint Special Operations Task Force and later commanded the 75th Ranger Regiment. In between, he completed year-long fellowships at Harvard’s John F. Kennedy School of Government and the Council on Foreign Relations. 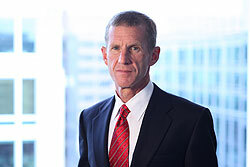 McChrystal, a West Point graduate and former Green Beret, retired from the military in August 2010 after 34 years of service. He now serves on the board of directors for JetBlue Airways and the Yellow Ribbon Fund, a new advisory board to support military families. He also inspires with stories from his extraordinary career. At NECA’s opening general session, McChystal will explain his four-star management strategy – stressing openness, teamwork, and forward-thinking. In response to the anticipated demand for electrical workers, the National Joint Apprenticeship and Training Committee for the Electrical Industry (NJATC) and Thomas & Betts Corporation have agreed to develop a joint national apprentice-training program. The agreement also establishes a framework for all Thomas & Betts (T&B) programs and initiatives serving the International Brotherhood of Electrical Workers (IBEW), for which the NJATC is the national training organization, the National Electrical Contractors Association (NECA) and the NJATC itself.